1. What is the vessel’s ability to demonstrate history in her physical fabric? Evidence for designs, functions, techniques, processes, styles, customs and habits or uses and associations in relation to events and people. How early, intact or rare these features are may impact on significance. 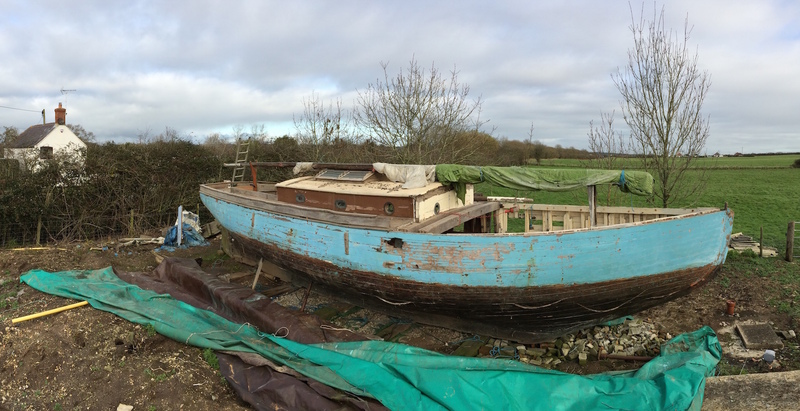 DOLLY VARDEN was originally built along the lines of an Itchen Ferry as a one-off design. Much of her hull survives with evidence of unique alterations which reflect her working life, for example, in 1888 her hull was altered to enable faster tacking as illustrated on her amended line plans. She was originally built with internal ballast which was then replaced with a lead keel enabling her six ton ballast to be carried externally making her unique at the time. This was eventually removed after her racing days and she reverted to carrying her iron ballast internally. At the pinnacle of her racing career her sail area would have been 1,700 square feet, however this was subsequently reduced to approximately 500 square feet. Two thirds of her original deck remains in reasonable condition. As an experimental vessel, her rigging was altered throughout her lifetime. During the 1970s, a raised foredeck and deckhouse, makeshift cockpit and an additional mast were added to her but these were removed during early conservation works to return her back to her original lines. She was the only vessel of her type built, although many of the innovations trialed on her were used on later craft. DOLLY VARDEN has strong associations to the Isle of Wight and Solent region. She is believed to have been built by J Samuel White of Cowes and, in the ownership of the Paskins fishing family, was successfully raced for Richard Grant, then Secretary to the Royal Yacht Squadron. She earned notoriety amongst British yachtsmen from 1888 after being purchased by Mr. Thomas White Ratsey of Ratsey and Lapthorn Sailmakers, who raced her for several seasons in the old 10-rater class, once beating the DIS and frequently winning against her contemporary NELL. In 1937, she was raced by Thomas Ratsey’s son and won the Cowes Cherbourg race. Other successful wins include Cowes Week, Round the Island races, the Ramsgate Gold Cup and the Portsmouth to Cherbourg race. Over 65 years as a racing vessel, she was sailed by notable figures including Uffa Fox and Austin Farrar and it is understood that King George V, a friend of Thomas Ratsey, came aboard her on occasion. Always based at Cowes, DOLLY VARDEN affectionately became known as “Queen of the Solent” for her many racing successes which are well documented with newspapers clippings, journal entries and photographs. Her original racing pennant is framed and on display at Cowes Museum. Known as a trial vessel, she would often race with different rig configurations and Ratsey and Lapthorn, the original sail makers, have the prototype designs of all these. DOLLY VARDEN has been recorded on the National Register of Historic Vessels since 2015. DOLLY VARDEN is built of carvel construction, with an elm hull below the water line and pitch pine above, on oak frames. The radical alteration of her hull in 1888 saw her square fore foot cut away and her hull strengthened to improve her speed upon change of use for racing and rig development. As a trial vessel, her change in form provides evidence of the various innovations that occurred throughout her lifetime such as aperture sails and the carrying of external ballast. She is currently located in Dorset undergoing assessment, with the intention to conserve her for operational use. DOLLY VARDEN was built in 1872 by J Samuel White of Cowes. Isle of Wight and is of carvel construction with an elm hull. The vessel was used as a test rig for sails and was configured in many ways in over 65 years of successful racing under the ownership of Thomas Ratsey of Ratsey and Lapthorne sail making fame. She is now located at Portsmouth at Boathouse 4 in the Historic Dockyard where she is on public display but plans to move her again and back into storage are under consideration.